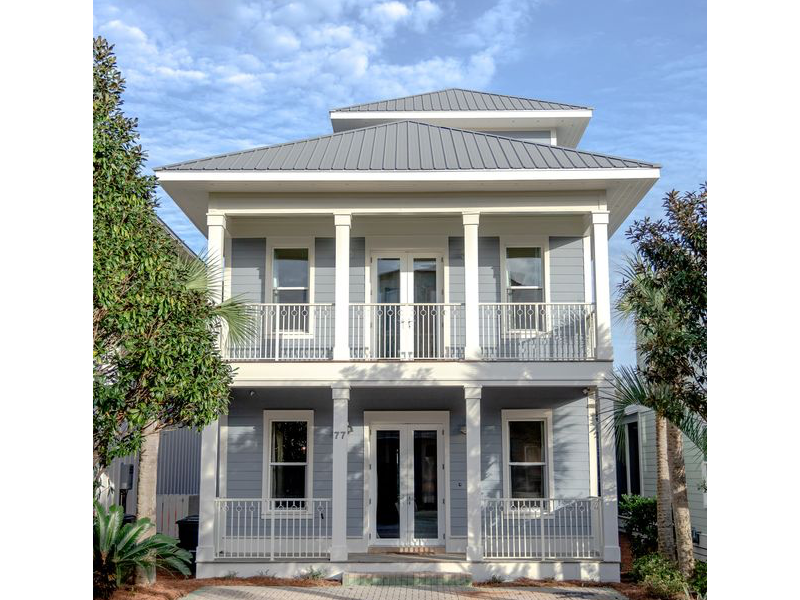 Rhapsody in Blue is a 4-bedroom, 3-bath home in the beautiful community of Seacrest, found along scenic highway 30A. Built in 2006, a complete home renovation was completed in February, 2019. The new décor features fresh colors, refinished wood floors throughout all three levels, new kitchen cabinets, Quartz countertops and all new appliances. Immediately past the front door is a large, open den and dining area with a wooden table. The new kitchen is fully stocked, next to a large island that offers plenty of bar seating. The main level bedroom includes a king size bed and convenient private full bathroom. The rear bedroom doors open to a spacious wood deck with a private outside shower to wash off sand from a great beach experience! The spacious second floor features a large master bedroom suite with sitting area. Within the master bathroom is a newly-tiled walk-in shower with frameless door and a large free-standing soaking tub. Close to the master suite is a third bedroom featuring three unique bunks. The fourth bedroom with queen size bedding and full walk-in closet shares that bathroom with the third. All bedrooms have doors to access a nice deck or balcony. The third floor is a loft that is perfect for hanging out. There is a large sectional sleeper sofa, television, and gaming system. Another set of doors open to a nice open balcony suited to relaxing and watching the sunset! Within easy walking distance of both Rosemary Beach and Alys Beach, the Seacrest community features the largest tropical lagoon pool on 30A. Several new features were added to the pool area in 2018, including enhanced greenways and stage area where local musicians play frequently during the summer evenings! We promise that a stay in “Rhapsody in Blue” will be a big part of your quintessential 30A vacation experience!